Typically desserts are something which those of us with diabetes approach with caution. If you’re blessed with strong self-restraint, choosing small portions of desserts can be an effective way of sampling a sweet without sending your blood sugar levels too high. To enjoy dessert without such strict size restrictions, try a dessert choice from below. Whilst the choices made a relatively low in carbohydrate, we would advise testing blood sugars two hours after eating to see which choices and quantities are appropriate for you. Fruit is quite high in natural sugars (fructose) so keep fruit portions sensible. 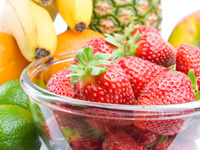 Berries and kiwi fruit tend to be better for sugar levels than banana and citrus fruits. Natural yoghurt is a great lower calorie alternative to cream, and if you’re watching your calories, low fat yoghurt will reduce the calories further. Most supermarkets these days have a range of sugar free desserts including mousse and jelly. Sugar free desserts are often simple to prepare and low in calories too, particularly if you use skimmed or semi-skimmed milk in mousses. A low carb cheesecake can be achieved by replacing crushed digestive biscuits for the base with a lower carb alternative. Almond meal is a good substitute for digestive biscuits. Sugar is typically used in the cheesecake filling but this can be replaced with a sweetener. Add fruit of your choice for a mouth watering topping. Give your fruit intake a twist by having chocolate covered strawberries. Using dark cooking chocolate will help you to keep the carbohydrate values. Start by preparing the chocolate. Take cooking chocolate and chop it into even sized chunks. You will need a glass bowl that will fit securely over a saucepan without getting close to touching the bottom of the saucepan. Put an inch or so of water into the saucepan and apply gentle heat and when it starts to simmer turn off the heat and place the glass bowl, with the chocolate chunks in, over the saucepan. The chocolate will melt over the steam in the saucepan. As the chocolate starts to melt, stir it with a spatula until the chocolate is fully melted. At this point remove from the glass bowl from the saucepan and keep stirring until the chocolate consistency is smooth. Keep the stalks on the strawberries to make dipping easier and when covered, lay them down on a plate or baking tray. Put the plate or tray into the fridge for a few minutes to allow the chocolate to set. With a few choice substitutes and perhaps a couple of attempts, low carb cakes are possible. The key to low carb baking is in replacing sugar for an appropriate sweetener and replacing flour with almond meal.